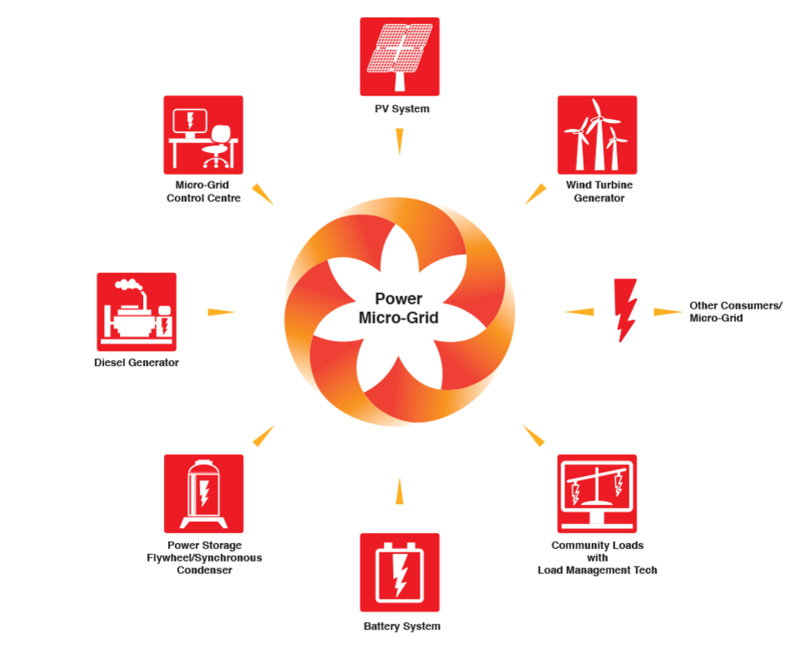 Microgrids with Storage - DAI Inc.
​​Microgrids are self-contained energy systems that generate, transmit and distribute electricity. They have the unique ability to operate either as a stand-alone energy system, which is common in remote locations, or in tandem with existing electricity infrastructure to provide grid stability or backup power generation. The electricity flowing through microgrids is consumed locally, resulting in short transmission and distribution distances. As a result, the amount of electricity lost via transmission and distribution in a microgrid is smaller than the amount of electricity lost via long-distance transmission and distribution in the main power grid. Since microgrids are self-contained, the power generation, transmission and distribution activities are highly controllable. Microgrid electricity is commonly produced by more than one source of generation, and DAI’s portfolio of microgrids includes diesel/solar and diesel/wind/solar microgrids with battery storage. When multiple sources of electricity generation are involved, control systems automatically switch between available power generation sources and energy storage. In a diesel/solar microgrid with battery storage, for example, the control systems will decrease diesel fuel consumption when the sun is shining and the solar panels are producing electricity. When the sun sets and solar energy production decreases, the intelligent system knows to use either stored energy or diesel fuel to satisfy electricity demand. Click on the links below to learn more about DAI’s microgrid projects.